Seatroopers extend the reach of the Empire under the oceans of its million worlds. Seatrooper units are able to fight campaigns completely underwater,for extended periods. Seatroopers support the aquatic garrisons assigned to ocean-covered worlds, are backed up by swimmer armored transports, and can be deployed by submersible waveskimmers. In order to fight in such a demanding enviroment, the Seatroopers require a specialized weapon. The standard issue weapon to Imperial Seatroopers is the SoroSuub Seatrooper One, another Stormtrooper One variant. 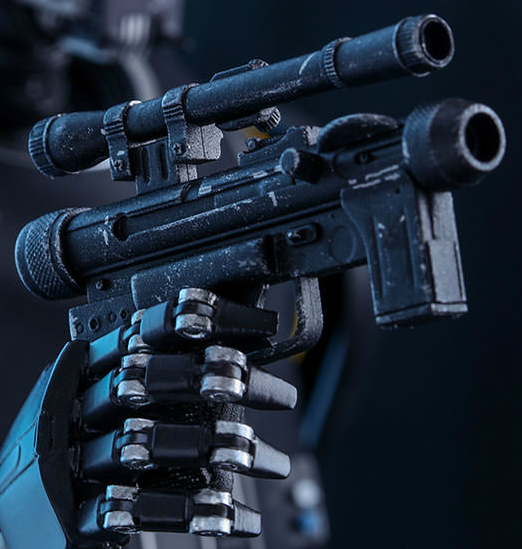 The back end of the weapon is nearly identical to the Stormtrooper One, except that the retractable stock was removed and the weapon was water-proofed. The barrel was extended greatly (almost to the same length as the Stormtrooper Three) to mount the under-barrel speargun. The speargun carries three spears (one loaded at all times with the other two side-mounted on either side).